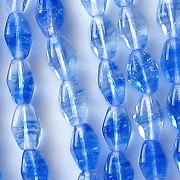 8mm long bicones with rounded edges. 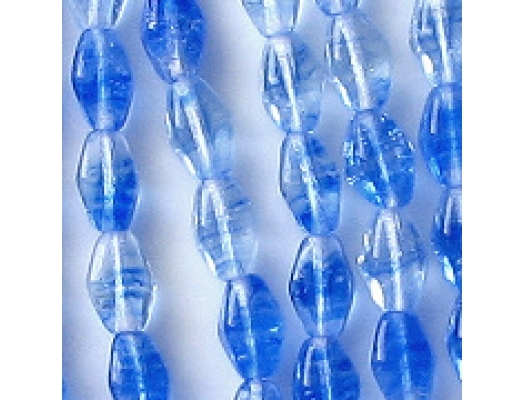 At least 5% of these beads (possibly more) have cracks, and the cracks are in clusters, meaning that most cracked beads have a bunch of cracks and not just one clean crack. That makes the cracks easier to see, but still not easy to see. 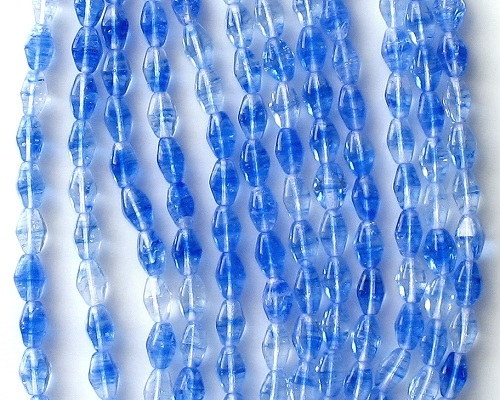 A fair number of beads also have bubbles in the glass, though I don't consider that to be a serious defect. As a result of this, I have reduced the price from $3.60 (what I would have charged) to $3.00 -- and I am including an extra 5 beads per lot. I never transferred these beads when I switched shopping carts in 2012. I finally got around to transferring them in December 2017. Because these are old beads, the picture is old and not so good. The shade of blue may be slightly different from what you see in the picture.